I think that’s what strikes me the most here: the theme of change. In most werewolf stories, the idea of shapeshifting into the wolf is the central conflict. When the full moon rises and the werewolf loses control, what if he hurts someone? Wouldn’t it be tragic, especially, if it’s someone he loves? For Drake, though, the wolf is more a manifestation of his true self, skin he’s more comfortable in. I feel like part of Autumn Moon’s point is this man of God has always been a wolf, and now when he changes, there’s the idea that, even when he was human, that wolf was there inside him all along. That theme comes full circle in I Am The Night. As much as anything, then, I Am The Night is about the struggle to be human when the truth is it’s in your nature not to be. It’s about Drake struggling not to hurt someone as he moves among people and attempts to blend in. As a foil to that idea, Slade introduces vampires to his universe, and before you groan because you immediately associate vampires with sparkling skin and teenage love, these vampires are amazingly original and terrifying. Whereas there’s something regal and beautiful about the shapeshifters in this world, the vampires are twisted, horrid, and repulsive monstrosities. They are absolutely vile creatures, and if Drake’s struggle is in living among humans, they’ve let it all go and enjoy living on the fringes while preying on the meek. In some ways, the vampires are like insects, living within the walls of society, in the dark places, and feeding on whatever they can get. Even as I Am The Night simplifies, it ups the ante. Now, in Drake’s hometown, he has a connection to the locale, but more than that, far away from the town that had embraced the shapeshifters, Drake must hide his true nature, if not for the safety of those around him, for his own security in the instance that humanity discovers him. Of course, much of the time, Drake is indifferent, an effect of his change. But time and again, something pulls him back to his human side. 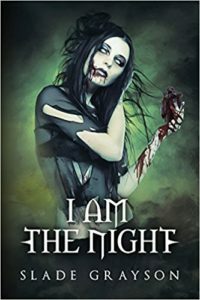 While I Am The Night is adamant that Drake Burroughs, human, is gone and Drake Burroughs, wolf, is the only one that exists now, the story at least suggests Drake isn’t completely beyond salvation. Beyond all of these thematic and narrative concepts, I Am The Night is just a hell of a ride. There’s a savagery to the way the fight scenes and chase scenes play out in a way Autumn Moon just didn’t have. In Autumn Moon, we read about characters interacting with monsters. Now, we’re reading first-hand about a monster, and Slade has nailed that experience. As these monsters face off and tear each other apart, it’s less a question about who will win and more about how far they’re willing to take it. I Am The Night is absolutely its own story. Could you read this one without reading Autumn Moon? Probably, but I wouldn’t recommend it for the simple fact that it will be better if you start with Autumn Moon. Moreover, I Am The Night is the second book in a series that doesn’t just give you a continuation. It doesn’t just give you more of the same. It gives you new experiences and a new world within the old. Much like Drake after being reborn, it’s like returning to the world of Autumn Moon but seeing it for the first time through completely different eyes. Tagged Books, Fiction, Horror, Slade Grayson, Vampires, Werewolves.